At Naheola Credit Union, we seek opportunities to give back to the communities we serve through surrounding school systems and civic engagement. For more information regarding donations, please contact Ashley Coplin at (334) 287-0661 or email acoplin@naheola.com. 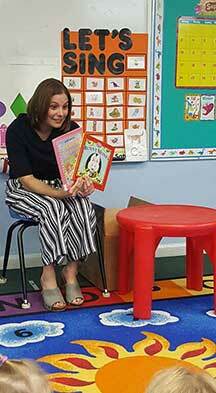 The Credit Union read books pertaining to money to a daycare class. The Credit Union also interviewed several of the students about their perceptions of money. To see their answers, read our blog What Do Kids Think About Money? The Importance of Early Financial Education for Children. The Credit Union teamed up with the Demopolis High School broadcast team to create a video. 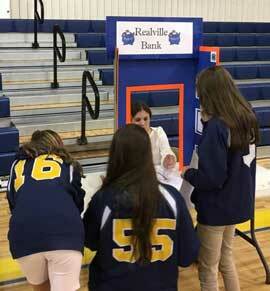 The Credit Union participates in Reality Check career fairs at Patrician Academy and Choctaw County High School. These career fairs are designed to illustrate examples of real life scenarios as they relate to living expenses in terms of transportation, housing, parenting, etc. The University of West Alabama is located within the service area of the Credit Union. Naheola partners with UWA on various activities from providing financial literacy opportunities for students and participating in career fairs to name a few. For more information about UWA, visit their website. The purpose of the Naheola Credit Union Marketing department is to communicate effectively the products and services we provide to our members. The marketing department will strive to provide our members with educational opportunities regarding our products and services, as well as, work with other departments within the credit union to enhance and manage the membership experience. 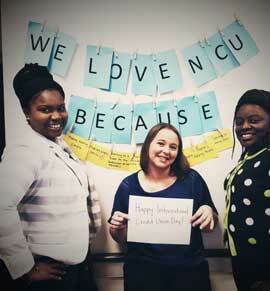 The Credit Union celebrates International Credit Union Day. This special day is a great way to recognize our members and employees for all of their hard work. Employees, Erica, Jessica, and Donna are in a front of sign that allows members to write down what they love about the credit union. We strive to provide our members with educational opportunities regarding products and services the credit union offers. Members not only get to enjoy a free lunch but fellowship as well with other members and employees. View the latest Naheola newsletter. For more information regarding upcoming credit union events, as well as, community events, please view our calendar. Be sure to like us on Facebook and follow us on Instagram and Twitter. If you are interested in receiving emails from Naheola, please email acoplin@naheola.com.